catholicbeer: "Beer Swap"??? What a simply divine idea!!! "Beer Swap"??? What a simply divine idea!!! As part of my ongoing effort to make people aware of the great beer blogging that happens around the world I wanted to mention a great idea that I saw on a great blog called "I Might Have a Glass of Beer". 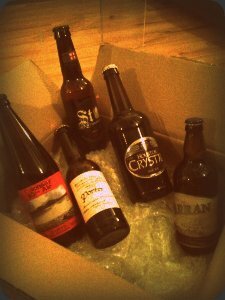 Now, I am sure that having a "Beer Swap" was not first introduced to the world here, but since it was the first I had heard of it (at least in being so nicely organized as a global parcel swap) I am giving all the credit to Barm. Also don't forget to put your entries for the best beer limerick on our most recent contest. The winner will get something cool (we're still waiting for Brian to announce what). Divine in word and in deed! I can't wait. I hope I get a box full of Corona! Yeah, I hear that the follow reinheitsgebot religeously in Mexico.